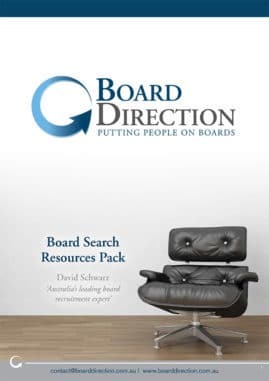 Download your FREE Board Search Resource Pack! Gaining a board appointment is a highly competitive exercise so it is critical you understand how people are appointed, what will separate you from your competitors. This comprehensive resources pack will guide you through the minefield of NED recruitment - from finding a suitable board role to preparing for a board interview. Contained within are all the tools and templates you need to “dare them not to appoint you” including: Board CV & Cover Letter templates and a comprehensive list Board Interview Questions plus much more.